I’ve been meaning to write a post about my Elecraft KX1, because, of all of the rigs I own, it’s the most-often-used, thus the clear favorite in my stable. 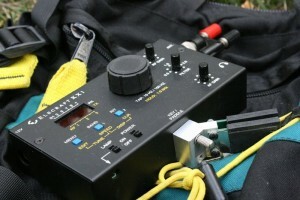 But: this morning, I read John Harper’s (AE5X) excellent assessment of the Elecraft KX1 vs. the Ten-Tec HB1B. He provides some significant numbers to consider when comparing these two lightweight CW-only QRP rigs, and makes a great case for elevating the newcomer HB1B over the KX1–at least, for some readers. I’ve had my Elecraft KX1 for over three years, and, in all honesty, absolutely love it. But, let’s face it: if I didn’t have one, if I had never touched nor used one, I would be seriously tempted by the HB1B–for its price, for the fact that Ten-Tec sells it (I’m a long-time Sevierville radio fan), and for the fact that it’s not a kit. Oh, yeah: and because it works very well. However, having used the KX1 for so long, I know that the HB1B (at least in its current state) could not replace my KX1. But before I explain why, I would like to make some strong points in favor of the HB1B. At least on paper, the HB1B has better filtering, a better display, and generally speaking, more bells and whistles than the KX1. Best of all, it comes fully assembled. Why is this last point an advantage–? For a number of talented QRPers reading this, building the kit is the best part! I know, I get it…And to tell the truth, I want to be like you kit-builders out there! But I am only now getting into kit building, and building my confidence in kit-building. I’m sure there are many others out there like me. For these QRPers, please note: the KX1 is not a beginner’s kit. I did not build mine. When I bought my KX1, I purchased it from a KX1 beta tester and professional engineer. The soldering and overall build quality are top-shelf. Moreover, no matter how great an Elecraft radio is, it’s only as good as the person who built it. If the builder does sloppy work, your rig’s longevity and performance may suffer. Since you’ll likely be taking the KX1 with you everywhere, and it’ll experience a fair amount of movement (aka, hard knocks), this is especially important. If, like me, you’re not prepared to take on building a KX1, fear not!–you should simply purchase from someone who knows their stuff: Elecraft can suggest some builders (including the amazing Don Wilhelm, W3FPR) or you can simply purchased a used KX1 fully-assembled. Or, you can simply purchase the fully-assembled HB1B. So, why do I not find the HB1B enticing? As AE5X mentions, there is no internal antenna tuner option. There is no way (at least, on this version) to attach paddles directly to the rig. Why are these features so important? Well, my KX1 has an ATU, four bands, and an attachable paddle. One of my favorite things to do with my KX1 is, while traveling, to pull it out of its Pelican case, toss a 28′ wire into a tree, and lay a ground wire. As I stand there, I can hold the KX1, tune the antenna (easily 40M and up, with the internal ATU) and work stations my favorite way: while standing up. I can also (if I like) sit for a moment, then jump up again, walk a bit, and generally move freely–just not possible with sit-on-a-table units. My Elecraft KX1 fits nicely inside the Pelican 1060 case. There's even room to fit an external Whiterock paddle. Additionally, everything I need fits inside a Pelican 1060 case. The Kx1 itself is an all-in-one unit–nothing external to attach, unless I want to. Oh, and I can also operate the KX1 with gloves on in below-zero conditions. Why would I want to operate standing up? Fact is, where I go, I’m only operating for thirty minutes or so, and in places where there’s no convenient spot to settle down or get too comfortable. In many cases, I’m operating on a whim–when I can grab a few minutes in a busy itinerary, or on a hike or day trip. With the Kx1, this is remarkably easy to do. I can have my KX1 on the air in four minutes or less, in most cases–and that includes the time to hang a wire–! Packing up is also quick. This kind of operation feels as free as flying a kite. Spontaneity at its best. Part of that functional synergy comes from the fact that there are no additional components to hook up (i.e., no external tuner, external paddles). 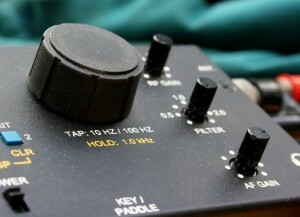 With the HB1B, I would be forced to either build a set-up, so that I could stand and hold the transceiver, tuner and paddles, or I’d have to…sit down. I had been designing portable QRP gear for my own use for many years, including the “Safari 4″ (documented in three issues of QEX magazine in 1990). The Safari-4 was 3x5x7”, but it was fully self-contained, including an attached keyer paddle, internal 1-Ahr gel cell and manual antenna tuner, wattmeter, SWR bridge, and 4-band coverage. But it was too large for backpacking. Later, I designed some far smaller rigs with very good performance for NorCal and Wilderness Radio, including the SST, NC40A, and Sierra. Then I started Elecraft with Eric, WA6HHQ. After we had success with the K2 and K1, I pitched the idea of a smaller version of the Safari-4 to Eric. There were two inspirations for this. Back in the 70s, W7ZOI (Wes) created his “Mountaineer”, which was a crystal-controlled 40-m QRP rig that was very simple to use, very small, and self-contained, in that battery and paddles were built in. But it had no VFO, no ATU, a single band, and no frills. Taking what we’d learned in the K2 and K1 designs, I figured we could pack a great radio into this same size using updated technology. It had to cover at least 40 and 20 meters, and the idea was to use latching relays to minimize current drain and simplify band switching. We also used a DDS chip for the VFO–not quite as pure as crystal control, but just as stable, and totally adequate for a portable radio. The other inspiration was my idea for an attached, but easily removable and mechanically reversible, keyer paddle. This became the KXPD1. I literally woke up at 5 AM with this idea. I realized immediately that this was the enabling technology for a hand-held radio, and I got busy with the design. Having spent time camping and hiking with other rigs, I also knew that the ATU had to be built in. This allows the use of ad-hoc, wire-in-a-tree antennas, which is the secret to quick setup. It was a challenge creating an ATU that’s just 1 x 5″, but it worked. We spent weeks refining the rig and the ATU to work with typical field antennas, adjusting the component values to cover 40 and 20 meters. When we added the 30-m module, we found that it handled this well, too. You can’t overlook performance and features, either. The KX1 is stable in all operating environments and draws only about 35 mA. It includes a variable-passband crystal filter that can be widened out to copy AM and SSB signals, and can even do cross-mode (transmitting in CW while receiving LSB or USB). It has a full set of frequency memories and CW message buffers. For blind hams (or when you’re too tired to keep your eyes open), the KX1 has a 100% Morse-audio-feedback system. I tested this firmware with my eyes closed, and the result was very well-received by the blind amateur community. Thanks for the history, and your inspiration, Wayne. Love it! The KX1's Tuning, RF, AF and Filter knobs are very easy to operate--even with gloves on! When you hold and operate the KX1, this legacy is all too apparent. Thoroughly thought through–down to a built-in LED lamp for logging–and, without a doubt, the original inspiration for several radios that followed: the HB1B, the MFJ 92XX series, and the Hendricks PFR3. My guess is that the next generation of HB1B will have some of these clever features. In the meantime, if you’re in the market for an inexpensive, CW-only, very portable QRP rig, and you’ve no plans to embark upon impromptu operation, the HB1B could be your rig. Based on my experience with Ten-Tec, if they sell it, they’ll give you excellent customer service. 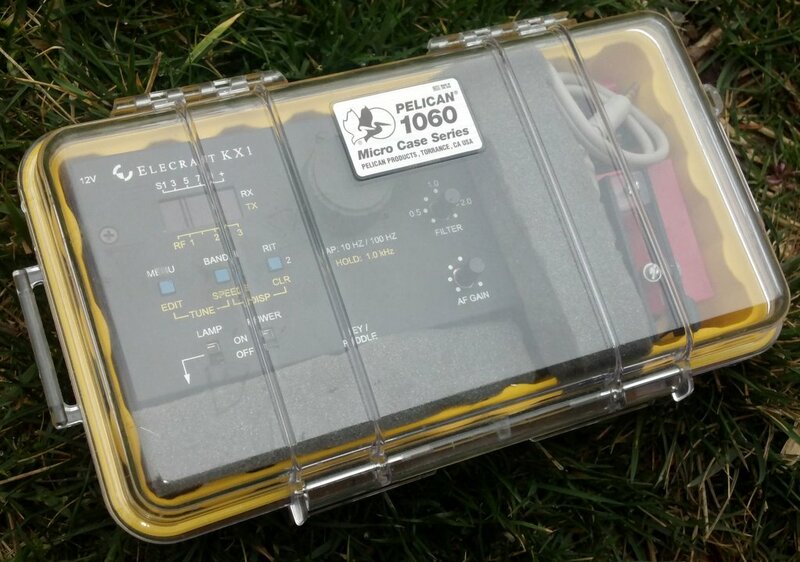 That is the beauty of these two choices, both Elecraft and Ten-Tec are excellent companies to do business with. I only think I’d give up my KX1 for…the new KX3, and I’m not even convinced I’d do that, yet. The KX1 has become my little travel buddy. Time will tell, though. Check back here–if I’m wooed by another QRP radio, I may eat my words. By the way, as I mentioned at the beginning of this post, the inspiration to finally write down my thoughts on the KX1 came from John Harper (AE5X) who has an excellent QRP blog that you should certainly add to your favorites! And thanks, again, to Wayne, both for his response, and for his original ideas that continue to make QRP so liberating. This entry was posted in CW, Grab And Go, Kits, QRP, QRP Radios, QRPers and tagged AE5X, Comparison of HB1B and KX1, Elecraft, Elecraft KX1, Elecraft KX1 vs Ten-Tec HB1B, HB1B, HB1B vs KX1, History of Elecraft KX1, KX1, QRP Radio comparision, Story of KX1, Ten-Tec, Ten-Tec HB1B, Wayne Burdick N6KR. Bookmark the permalink. Nice blog. But, I reluctantly disagree with TenTec’s customer service. I’ve bought lots of stuff from them, and had good experiences in the past, but they do not service the Youkits or HB1B products. My Tentec R4020 recently stopped working, and their service department advised me they did not repair them, and gave me the information for Youkits, in Canada, where I had to mail my radio for repair. Shame on TenTec, who used to be so good with customer service. I really enjoyed reading the above posted article on the KX1 and YouKits. When it comes to the display of both rigs, I think the YouKits wins hands down. All of the information is always there and you don’t have to go through numerous button pushing to change the display. The YouKits radio is already assembled. For those that enjoy kit building, the KX1 would win here. As far as an ATU goes, the KX1 has a great internal tuner. Since I only use resonant antennas, I can deal with the YouKits not having an ATU. Now the CW paddle issue, here are my findings. I not only have the YouKits HB-1B MK 3, I also have the KX3. I was given a set of Elecraft paddles for the KX3 and I had nothing but issues with them. They would always miss a beat or two. I took them apart and cleaned them numerous times and could not correct the problem with those paddles. The answer to the problem was to purchase the Palm Pico Paddles with the KX3 adaptor mounting plate. All I can say is these are great little paddles. They also come with a magnetic mount. This magnetic mount will stick to the side of the YouKits radios. So now I have a neat little set of paddles for my KX3 and YouKits. I am not knocking the Elecraft KX1. It is a great little radio, with an internal speaker that the YouKits does not have. 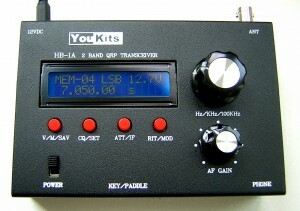 But for the price of the YouKits HB-1B MK3, you really get a lot for your money.